Cadillac had started by bypass Packard sales after World War II. By 1952, the General Motors division was really “feeling their oats” and wanted to showboat a bit on the dealer showroom, instead of just at the GM Autorama car shows that toured the country with far-out concept cars. Their answer was the Cadillac Series 62 Eldorado Special, priced at an astronomical $7,750 (for comparison, the Series 75 Imperial limousine was sold for “just” $5,818). 532 buyers opted to get these convertible cars, making them rarer than the limousine, which sold 765. Due to a catastrophic fire at GM’s Hydramatic factory in Livonia, Mich., late in 1953, some 1953 Cadillacs were fitted with Buick Dynaflow automatics referred to as “Twin Turbine” drive. 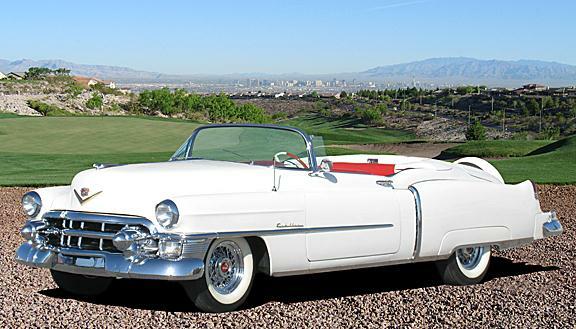 The 1954 Eldorados were again sold as convertibles only, and with a base price reduction ($5,738), 2,150 were sold that year.